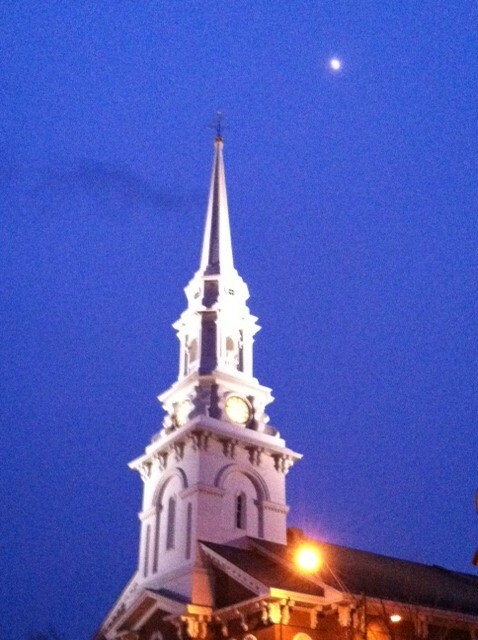 I was kicking around Portsmouth late yesterday afternoon and the bell in North Church rang the hour. The day had been windy and cold and the sky was preparing to spit snow. The weather puppets had not agreed on their talking points about this pending frozen matter. It was the kind of day when people start to give up on their New Year’s Resolutions because it’s easier to stay inside where it’s warm than to venture out to the gym or a snow-covered sidewalk. Ringing bells are beautiful; they signal the hour, they call people to worship, they may announce a wedding, or even a death. In some parts of the world, bell ringing is a masterful and mathematical art; Dorothy L. Sayers wrote a fascinating mystery about it in The Nine Tailors. When I heard the bell toll five in Market Square, I thought of the title of Hemingway’s book and then remembered that Hemingway was quoting John Donne. John Donne, of another age, wrote a collection of devotions in 1624; he wrote these while recovering from an illness. During his time of sickness, he heard the death knell and began to meditate on his own health and possible death. When someone suggests “no man is an island” and “there’s no ‘I’ in team” they’re echoing John Donne’s sick bed. One analysis of the meditation suggests that Donne was alluding to the uncertain nature of life and death and the importance of having one’s papers in order. Although any of these brief phrases greatly oversimplify Donne’s work, how easy it is to think there will always be time to attend to the important things of life…tomorrow. You can read the meditation in its entirety and decide for yourself. The bell tolls for me and I need to continue with my plans. Monday was not the day to give up. This entry was posted in Weather and Seasons and tagged Bells, Dorothy L. Sayers, For Whom the Bell Tolls, It rings for thee, John Donne, Market Square, North Church, Portsmouth, The Nine Tailors. Bookmark the permalink.